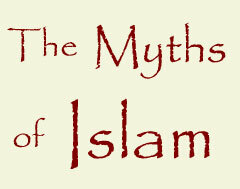 Muslims often complain of "misconceptions" about their religion in the West. We took a hard look, and found that the most prevalent myths of Islam are held by Muslims themselves, along with Western apologists. The only exception may be the misconception that all Muslims are alike. They aren't, of course, but many Muslims apparently believe this too, which is why there are various factions insisting that they are true Muslims, while those who disagree with them are either infidels, hijackers, or hypocrites.